Wexford University just opened fall course registration for its online master of science degree in nutrition and exercise. The unique program is designed for weight management consultants and coaches, nutrition advisors, authors and more who are interested in learning more about the intersection of nutrition and exercise. Nutrition careers are on the rise. Coaching, consulting, advising or writing about diet and nutrition provides a lucrative and rewarding career. If you are what you eat, what are you these days? Fresh summer watermelon and roasted almonds, or fast-food burgers and fries? If you are interested in learning how what you eat affects how you perform, then Wexford University’s online master’s degree in Nutrition and Exercise, with fall classes starting Sept. 27, is an ideal option. 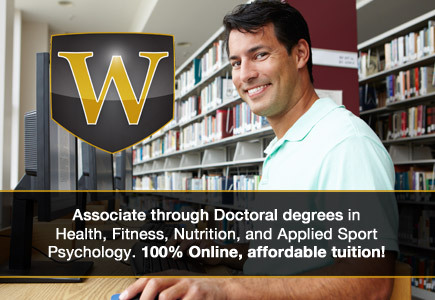 Registration for spring classes is now available at http://wexford.edu/degree-programs/master-of-science-degree-in-nutrition-and-exercise/. With a master’s degree in nutrition and exercise, graduates are prepared to coach others on their weight and fitness goals, create healthy eating and living plans, offer unique programs at health clubs and gyms, and to write, talk or teach in this growing field. Topics that are covered in the program include physiology of exercise, advanced nutrition and nutrition for special populations, metabolism and muscle, the science of metabolic conditioning, exercise and sports supplements, vitamins and fluids, motor control and learning, research methods and more. In addition to the master’s degree in nutrition and exercise, Wexford University also offers an associate of arts degree in Fitness Training; a bachelor of science degree in Health and Fitness; master of arts in Applied Sports Psychology; and a doctor of Applied Sports Psychology degree.